Scouting opportunities of national scope, or open to any group anywhere. Local planning belongs somewhere else. All youth from Canada (ages 11-17) are welcome to attend. Leaders too! Note: Any information found outside of the official website may now be out-of-date. Our high camp, the Asulkan Cabin (7,000 ft.), is finally booked for our exclusive use and so we now have to turn our attention to some of the detail work (menus, schedules, duty rosters, etc.) which will, hopefully, pose no real challenge. Four leaders; five Scouts/five Venturers; five guys/five gals; all are going to have an incredible time next June/July. Is there any interest in doing this camp on an annual basis? If there is, we'll make it happen. So, who wants to come to future mountaineering camps? Last edited by Jody on Mon May 30, 2016 4:30 pm, edited 14 times in total. I sure do! This is the kind of adventure that Scouts should be experiencing. My biggest question is how would an inexperienced climbing Troop fit into this kind of adventure? As an example, our troop is being rebuilt from the ground up with 11 first year scouts, and no seniors. We are in Eastern Ontario, and have chosen as a focus canoe tripping and, within two years, lightweight hiking/camping. How would you take a Troop like that, insert them into a climbing expedition, and meet proper risk management? Hoping that this is a real possibility. I will second what Angus just wrote. But, I'd also like to add that I showed this to my son, a second year Cub and my daughters (Blue and White tails)... they are all keen on going. Today! This looks awesome and I would love to see this made annual so that when the time comes, I can send my kids and their Scouting friends. Angus: I started with the attitude that there is nothing that a Scout can't do - you just have to take them out and prove it to them (and their parents)! I started with two 2nd years (12 year olds then) and the rest 1st years (mostly 11 year olds). At one point very early on, I heard one boy say words to the effect of, "I think you grossly overestimate our capabilities.". The actual language he used indicated that they were his parent's words and not his own. That was the only boy that dropped out of the program. The "limitation" was all his parent's, not his own! I find the hardest challenge getting the Scouts equipped....not their ability to do the hiking and camping. The special gear my guys need is a little expensive no two ways about that! But...we always seem to find a way. Throughout these adventures, I keep a couple touchstone phrases in my head. The first one is this: "Not one Scout has a bad experience!" This is supposed to be fun! There is no point in doing any of this if one of the Scouts has a really bad experience and quits. It's like the doctors say, "Do no harm." This is not to say that they aren't going to suffer a bit. It ain't climbing unless there's a bit of suffering involved. "Please, dear God, don't let me f**k up." And then just get it done and have some fun! The limitations are never the kid's....they're ours and their parents! This doesn't mean that you can get a Scout to carry a load that is beyond his real capabilities. You just have to tailor the event to the realities of the Scouts. For example, the Scouts going on the 2013 Mountaineering Camp can handily carry 20-25 lbs. of personal gear up to the high camp. I cannot, on the other hand, expect them to to be able to carry, in addition to that load, the 20 lbs. or more of food they will each need for the week. So, we will either chopper it in or have it portered in. Problem solved.....the kids get to have fun! Getting back to your original question: these Mountaineering Camps will not be for everyone. The Scouts will have to be fit enough to carry their own load. They will have to be mentally tough enough not to quit at the first sign of adversity (which for certain they will meet). They will have to be emotionally balanced enough to not allow "shiny ball syndrome" to put them or the team in jeopardy (if we are in a dodgy position on a mountain and a youth cannot focus for more than a few seconds at a time, and =="Hey, look a squirrel! "== could cost him his life or limb....then our program is not for him). I believe in the Scouts. I believe that 95% of them meet these basic requirements. So, where's the challenge? I'm holding up a mirror: Mom, Dad, Scout Leader.....what do you see in the mirror? When I decided to get back into this just over two years ago, I had fear. Heck, I hadn't slept on the ground in over 25 years (thank God for my Exped Downmat 9: http://tinyurl.com/abu9jux). We can't let our fears rule our lives. When I started retraining all my mountaineering skills this year, I had fear. As strange as it might sound, I've had a massive fear of heights all my life. When it was my turn for my first rappel in 30 years I really had to control my fear (near nausea, etc.). Thank God there was so much to do before stepping backwards off the 60 foot cliff (inspect the anchor, check that all the biners are locked, check my rappel device, check my prussik backup, unclip my personal safety tether, etc., and, well, I guess it's time to go for a little walk!) that I was able to keep my mind away from what would have been self-defeating thoughts. Every time I've gone out since then, my tolerance to exposure (a climber's term to describe the "hairyness" of his position - the amount of empty space below his a$$) has increased and so has my joy of being out there. I still have massive limitations but that's not going to stop me from babystepping my way further and further forward. If a Scout is fit enough, mentally tough enough and emotionally balanced enough...then the rest is up to us. What have WE done to make ourselves ready for the challenge? What have WE done to train ourselves so that we can shepherd the Scouts through these challenges safely and with confidence? Luckily my spouse has put up with the considerable time, effort and expense it has cost me just to begin the process of getting myself ready. I keep looking at the young Scouts and thinking, "Oh man, in a year or two or three these guys are going to be able wipe the floor with me unless I do something about it now." Proper risk management: not really an issue when you've got Scouts qualified to participate and Leaders qualified to lead the activities. The best way to prepare for all of this is to Just Do It! Everything else is just a dodge to excuse us from the challenge. Last edited by Jody on Mon May 06, 2013 4:42 pm, edited 29 times in total. I showed this to my son, a second year Cub and my daughters (Blue and White tails)... they are all keen on going. Today! Last year, just before the end of school, we did a slideshow of our adventures that year at our Scouts' school. At the end of it, one boy came up to me and forcefully said, "I'm joining your group!". He was a bit short so I asked his age. He said he was 10 and I so told him he could join Cubs. "Oh, no way, I was in Cubs once and they didn't do anything. They played nothing but games at the meetings and they only went camping once. I'm joining your group! I want to do the stuff that those guys get to do!" I was a bit taken aback by such a brash young guy and didn't really know how to respond and then it occurred to me to ask him when his birthday was and he said, "September". Well, okay, no problem, you're in! He had his parents send me a completed Registration Form for this year within 24 hours of that slideshow presentation. [Without identifying the person without first asking permission...] Just over a week ago, one of the 2013 Mountaineering Camp team members told me that he/she sat his/her parents down in the living room and did a Powerpoint presentation for them to explain why they should let him/her attend the Camp! Yes! That's the way to do it! Who could say no to that? Last edited by Jody on Fri Nov 09, 2012 3:54 pm, edited 2 times in total. Jody wrote: we did a slideshow of our adventures that year at our Scouts' school. At the end of it, one boy came up to me and forcefully said, "I'm joining your group!". He was a bit short so I asked his age. He said he was 10 and I so told him he could join Cubs. "Oh, no way, I was in Cubs once and they didn't do anything. They played nothing but games at the meetings and they only went camping once. Not trying to hijack your thread, but this type of marketing is the best method to attract kids. With school talks like that, kids will pour in. Then we just need to fix the sections that run a program like that Cub pack. I like the anecdotes. You are writing the guy who takes his Beavers camping 4x / year, they make their own meals, etc. Last year, my six year old (now 7, almost 8) rode her bike almost 20 km in one day. Give them the challenge, they can do it. I am curious to know, when you combine youth from many groups, how are patrols formed (or are they)? Is this more adult led? I don't want to knock this, and I know that adult leadership has it's time and place, just wondering about the leadership and social dynamics of the trip. Another issue I can see is the internet. Someone once said, on the internet, no one knows you are a dog. Being in Ottawa, I only know you (Jody) from TalkScouts. What can we do to give parents any comfort and know that you are a real leader and that CYS is being followed, etc? Just wondering because if this does become an annual event with youth from all over Canada (Angus from Brockville, me in Ottawa, etc. ), some form of "overhead" might be required. Will you require the youth's Scouters to accompany the youths? Hawkeye: All good questions...some never occurred to me before and some I actually do not yet have an answers for (hey, but that never stopped me from anything). Don't forget, I'm making all this stuff up as I go (I've never done any of this before so I go slowly and babystep forward, learning all the way). The 2013 Mountaineering Camp is 4 leaders and 11 youth [UPDATE: we now go with 3 adults and 9 youth]. Don't forget this is a mountaineering "school". We won't be operating as a troop with patrols. We will be all working as one team (although we will break the youth into three rope teams for climbing). We will probably have pairs of youth prepare the main meals for the whole gang. There is only one kitchen and only room for a couple of cooks at a time. It would be a simple matter for a two person team to put together pancakes or spaghetti for everyone. We can also have two people do the dishes for all each meal. Everyone will have to pitch in. I don't know if my camps resemble any other group's camps. We don't do organized activities (except fun training type activities like avalanche beacon drills, etc.). During our winter camps, for example, if the Scouts aren't setting up their camps (digging kitchens and living spaces out of the snow, etc. ), cooking their meals (and the never-ending task of melting water), or snowshoeing up some mountain, then the Scouts are on their own free time and can do as they please. They sometimes dig snow caves or take the utility sleds off for a little tobogganing. 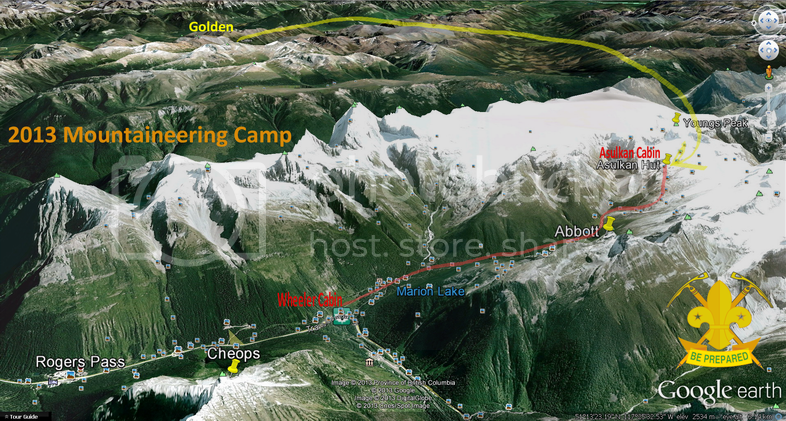 The 2013 Mountaineering Camp will be like that. We will have a lot to accomplish each day and when we're done then the Scouts can do as they please. After-hours I expect to see the usual: exhausted, happy, sunkissed mountain climbers happily chatting away and sharing stories from their day's activities while they dry their sweated-soaked base layers and socks in the sun, air their boots on the porch, teach each other knots and other things that they learned during the day, sip some sweat tea on a rock overlooking the valley 7,000 feet below, chat with their families back home on our cell phone (or skype on our netbook), lie in the sun on a blanket and snooze or read a book...whatever...it's their time. Social dynamic-wise, by the end of the week these kids are going to be one tight-knit group: they will have had experiences that only each other on the team will understand. They will have expanded their Scouting brothership by entering into the "Brothership of the Rope". Esprit de corps is a wonderful thing to see materialize in any team. They will have earned the right to swagger a little. What can we do to give parents any comfort and know that you are a real leader and that CYS is being followed, etc? You might notice that I make no attempt to hide who I am on the internet (check my signature file below). And as far as CYS goes...don't forget these Scouts will all be packing ice axes...I dare anyone to mess with them! Will you require the youth's Scouters to accompany the youths? With the current format: no thank you! I say this only because the alpine cabins that I currently envision using are usually of limited capacity and I want to maximize the spaces given to the Scouts. I also say this because the leaders present are supposed to be training the Scouts, not the other adults present. Heck, who cares about them, I want to go! I hear you on that one! The problem is that I want the kids to have a great time. Now if another Scouter wants to organize a camp for other Scouters and asks me to come along....hmmm....I guess I'd cross that bridge when I get to it (might be fun). Last edited by Jody on Wed Aug 31, 2016 4:29 pm, edited 9 times in total. You have great answers. However, and please don't take this the wrong way, taking over someone's identity like that is fairly simple. I think confidence would be increased by something coming either from your area or council. The thought of sending my kids across the country to go into the back country with someone I met on the internet... again, not trying to put your good work or you down. Otherwise, you look like you have it well planned out. Well, okay, you want references....well right now you could call any of my Scout's parents (email me if you really want to do this and I'll set it up)....or you could ask my the North Shore Area Commissioner (Stephen Tresidder) or the PCC Council Commissioner (Eleanor Oakley) who both know me. As to my resume....I realise that I'm coming at this a little late in life but I've got a whole lot more training to do to take this where I want it to go. Or.....wait until after July next year and ask the kids that attend the 2013 Mountaineering Camp. You've got me thinking. Just have to convince the wife..
We're not getting any younger....if not now, when? My children have already lost their mother to cancer...we're not here forever. Make the most of it! If someone else does the work (I can help)....it'd be fun to get a bunch of the leaders up in the mountains for a weekend or a week or whatever. I realise that there is a bit of resistance to the idea that WE CAN DO WHATEVER WE WANT TO DO. My approach is this: I'll be planning various projects. The "buses" for those adventures will be leaving the terminal on time and anyone is welcome come with us. That leaves two simple choices: either get on board or stand on the street corner and wave as we go by. I guess I'm lucky....I missed the past 30 years of "WE CAN'T". As far as I'm concerned: BP&P is not the "Book of No". It's the book of "Git 'er Done!". Last edited by Jody on Thu Aug 27, 2015 8:00 pm, edited 6 times in total. Sam: Cannibalism? We will find a way to get the food up to the cabin...no worries....we're going to eat like Kings! Updated: Parks Canada has graciously issued us a Helicopter Landing Permit and Alpine Helicopters will be airlifting our food for the week from their base in Golden, B.C. up and over the Selkirk Mountains to our Cabin at 7,000' at the south end of Rogers Pass! Last edited by Jody on Mon May 06, 2013 4:56 pm, edited 11 times in total. you will like the reason calgary mayor is running again next year and not going into federal or provincial politics. We will almost certainly use an Alpine Club of Canada cabin high up in the mountains of British Columbia or Alberta for the 2014 Mountaineering Camp. 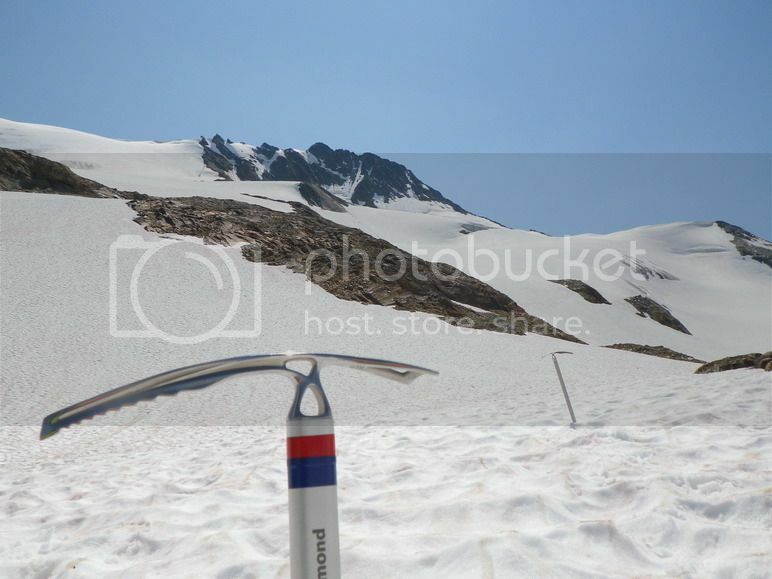 If you know of any other special alpine huts (or high mountain camps) that we could use, please let me know. I'm open to any suggestions. On the other hand...the Asulkan Hut is uniquely suited to this sort of camp. We may just return every year to it. That will force us to keep the numbers small each year but the Hut and its surrounding area are perfectly suited to this purpose. What could be better than another Mountaineering Camp next summer? How about TWO Mountaineering Camps next summer? This year we are running two week-long sessions back-to-back at the Asulkan Hut in Rogers Pass. In future years, I can see changing it's location to inspire previous MCampers to return for an even greater challenge (imagine a week up in the Tantalus Mountain Range) and, possibly, running the camp for more weeks in the summer.